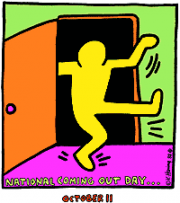 Trumpets and glitter, it’s National Coming Out Day! Remember the agony? The fear? The sudden relief and freedom? Coming out for many of us was a process that started off in darkness and ended in light…a realization that took courage to admit and led to newly discovered peace and happiness. For all of us who survived, let us celebrate and encourage those who are still fighting to be free of the shadows. I’m sitting on the sofa in Caroline’s apartment in Chapel Hill, NC with a heavy lump in my chest. The warm light from the lamps fills the small room and pushes back the chill of the night outside as a little bit of rain is falling on the tree leaves. My best friend in the world is sitting beside me waiting for me to go on, but I’m stuck and can’t speak anymore. Her blue eyes are open and expectant, and so friendly…they’re the eyes you want staring at you as you’re about to share your deepest, darkest secret. I mumble through a bit more…beating around the bush as if my admission of being gay to a friend will bring about earth-shattering change. I feel like I’m walking towards a cliff and with each step I’m scared and excited to finally take the step off. “I….uuhhhh…I,” I stop again feeling the tears behind my eyes and a dark voice whispers in my ear, this is it, this is the end, it’s over if you say this! The burden in my chest reaches up to my throat and I can’t go on. But I can’t go back either…I have to go forward…so I finally just say it–“I’m gay”–and before I can pull back to see the result, I find a sudden kiss on my cheek. For a moment I’m delightfully surprised and then blissfully thankful. Her eyes are still smiling and her face is even more relaxed than before. That terrible burden I had been carrying around for months–the darkness that pulled at my heart every moment and threatened to overwhelm me–was just swallowed up in that single friendly gesture of a kiss. A kiss that says, “Honey, it’s okay. Not a big deal. I love you”. Having that support from my friend Caroline was a lifesaver for me–literally. Thinking back about that time in my life still brings tears to my eyes. To all the allies out there, know that you play a powerful role in a LGBT person’s life. A supportive friend willing to listen is an invaluable asset to someone struggling to be honest about who they are to themselves and to those around them. The voices of self-doubt and self-hatred can be drowned out by the voices of friendship and love. So let’s celebrate self-realization and honesty! Let’s celebrate acceptance and freedom! This entry was posted in Personal and tagged coming out, friendship, gay, national coming out day. Bookmark the permalink.